Congratulations to reality TV star Danielle Jonas and her husband musician and “The Jonas Brothers” boy band alum Kevin Jonas on the birth of their second together, daughter, Valentina Angela. Proud uncle, Nick Jonas, announced the news on his Instagram yesterday. “AHH! I’m an uncle again! Congrats to my brother and sister in law on the birth of their new beautiful baby girl,” he captioned the share of a Snapchat still. The other brother, Joe Jonas also chimed in with his congratulations on Twitter. Fans had a head’s up that baby was on the way because Danielle posted a photo of herself in the hospital this week while on countdown to baby! How precious! The couple announced the news of expecting addition earlier this month via an Instagram photo of the couple in bed with Kevin reading a book about pregnancy and Danielle snacking on an assortment of chips and cookies with the caption, “Preparing for baby number two!”Over 9 million people have enjoyed Bellyitch's Award-winning Celeb "bumpwatch" pregnancy and parenting blog. Trying to Conceive? Download our FREE Fertility 100 ebook. Hunting for Top Maternity or Kids Brands? Our Bellyitch 100 is the free resource for you. Baby Shower Shopping? Check out out Top Picks on Amazon or our Gift Guides. Danielle Jonas and her husband Kevin celebrated a baby shower thrown by Fit Pregnancy magazine. The couple were featured in the magazine’s latest issue. This was their second baby shower. Earlier last month, the stars of Married to Jonas shared the bounty of presents they scored at an initial baby shower thrown by family and friends. It is not uncommon for moms and dads-to-be to receive multiple baby showers. Often times, a family member or close friend will host one for close ties, the workplace will throw a work shower and if there is family in a remote location, there will be a shower thrown there so those back home can also celebrate and shower the new parents. Burt’s Bees was among the sponsors of Kourtney Kardashian’s baby shower when she was pregnant with daughter Penelope. And also Holly Madison‘s who donated her gifts to the charity Baby2Baby. Target hosted Beverley Mitchell’s baby shower. The Sopranos Jamie Lyn-Sigler donated some of her baby shower finds to the Baby Buggy charity. 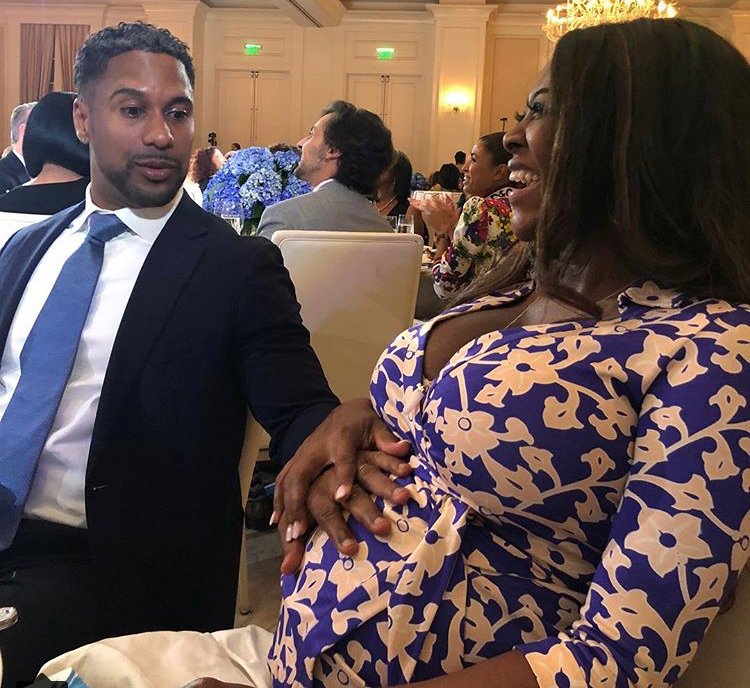 Several liquor companies provided the libations for cocktails served up at Love and Hip Hop’s Yandy Smith‘s baby shower. 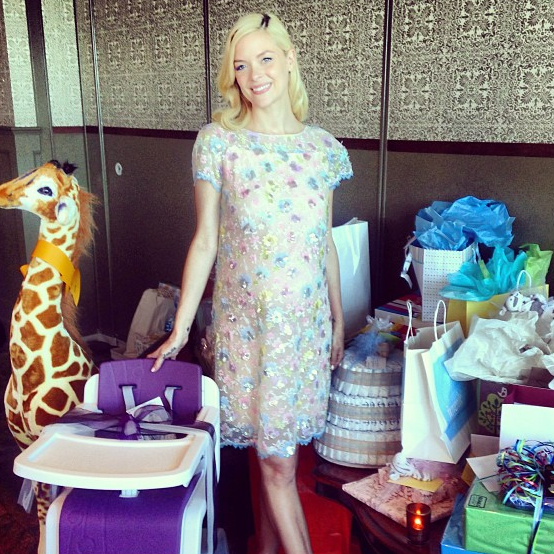 Jaime King enjoyed some fab brand goodies at her shower. Ecoya‘s Sweet Pea & Jasmine home fragrance collection, a pink Quinny Buzz Special Edition stroller, a mamaRoo baby swing, a pink Hoppop Bath tub, a pink Little Giraffe Luxe Blanket, a Timi and Leslie diaper bag and a 5 ft. custom-made giraffe by Melissa and Doug all contributed to Victoria Beckham‘s baby shower. Belly Bandit sponsored Jewel’s baby shower. So this week, Jersey Shore reality TV star of the longtime MTV hit, Jenni “JWoww” Farley teased some of her 3.58 million Twitter followers on an upcoming bump photo. Since the Snooki and Jwoww star announced her pregnancy with fiance Roger Matthews last December, she is yet to share an all-out baby bump photo. Interestingly enough, the comments to the post she linked with details about a teal one-shoulder Rissa of LaBling dress she wore October 2013 on Chelsea Handler‘s talk show this week piqued accusations that she isn’t really pregnant at all. “Maybe she is not carrying the baby?? Maybe she has a surrogate?” one named Chloe questioned. “I bet she faking a preg I think she adopting a baby! !” another named Joan added. And thus the convo diverted to commentary about whether she is pretending to be pregnant as a publicity stunt. Recall Danielle Jonas and Kevin Jonas‘ first pregnancy was similarly dogged by similar rumors and infamously Beyonce as well. One might notice that a sure sign a celebrity woman is pregnant is when she ordinarily posts non-stop selfies of her full body on social media but suddenly shares only face pics. It could be she is uncomfortable with her changing body and not yet figured out how to dress her bump or she is just keeping the news under wraps until the critical first trimester passes. It may very well be that Jwoww didn’t wait the three months and shared the news immediately and thus has not really started to show much. The speculation is unwarranted even if she is farther along because many women don’t show until well into their second trimester and others do a great job in hiding the bump under baggy or loose clothing. This incident may reveal a new disturbing trend among baby bumpwatch fans and followers of celebrities who announce their pregnancy. If they don’t reveal a bump or show a “normal” progression, they may be dogged by fake pregnancy rumors. Congratulations to Danielle Jonas and hubby Kevin Jonas of the Jonas Brothers on the birth of their daughter on Superbowl Sunday, February 2. This is the first child for the former hairdresser turned reality TV star and eldest Jonas brother. The couple married in 2009 and announced last summer that they were expecting their first kid together. Like Beyonce, the couple have been plagued with fake pregnancy and fake baby rumors as seen in this IB Times article and a Crushable post which claims to break down how fake the baby is. The Crushable article has managed to get a lot of people on board with the conspiracy theory but there are many clues in the article revealing that the author has never had a baby before. She questions a doctor visit with the baby’s heartbeat shared in Instagram because there is no video image of the baby, but dopplers take the baby’s heartbeat and have nothing to do with a video or video monitor. The monitor just happened to be sitting there. Thee photos she posted in IG where her tummy was flat were possibly old photos before the pregnancy. There are so many holes in the piece to go into that it’s not worth it. But what I did appreciate was the Instagram video Kevin shared with the baby moving inside Danielle’s tummy. That was THE best feeling during pregnancy inside and out. So cool of Kevin to catch that on video. The conspiracy theorists are wack! But um getting a baby detergent brand to sponsor your first photo release, hmmmm. Can’t knock the hustle. Danielle Jonas, star of Married to Jonas and Evelyn Lozada of VH1‘s Basketball Wives both shared an updated belly progression photo with their fans and followers on their respective Instagram accounts. Danielle and husband Kevin Jonas of E!’s The Jonas Brothers are expecting a daughter pretty soon. This will be the couple’s first child. They announced the news by showing a photo of the baby’s ultrasound last summer. Equally, Lozada, who just got engaged to LA Dodgers player Carl Crawford this past December, is also waiting for her baby, her second. She has a 20-year old daughter Shaniece from a previous relationship. She is about 7 months along. Beyonce isn’t the only celebrity who has been accused of faking a pregnancy and trying to fool the public. Reality TV star of Married to Jonas, Danielle Jonas and her husband Kevin Jonas are too. Numerous sites are reporting and citing an anonymous “friend” saying that the pregnancy is being faked to garner attention for the couple’s ratings-failing television show and the couple plans to announce a fake miscarriage if they are unable to secure a surrogate by the time the baby is reportedly due to be born this January 2014. So far, mainly conspiracy theorists or those apt to believe such rumors are buying this story as it is hard to believe. But as more stories surface and articles are printed that seemingly validate the allegations, more will jump on to the conspiracy wagon. Even as Blue Ivy Carter gets close to her 2nd birthday, there is still a good number of people who think she was delivered via a surrogate. Since Beyonce delivered in January 2011, we’ve seen rumors of other celebrities faking their pregnancy for attention including Kim Kardashian. The last season of BravoTV‘s Real Housewives of Beverly Hills focused almost exclusively on rumors that cas tmember Adrienne Maloof had used a surrogate to birth her children so as not to ruin her body, but lied about actually being pregnant and going through labor and delivery to save face and not come off as being a superficial and vain person.